Automatic watches are a complex piece of technology so you won’t often find anything decent for a very affordable price. There are however some brands that strive to bring you a long-lasting, good quality watch for reasonable prices, which is great news for us. 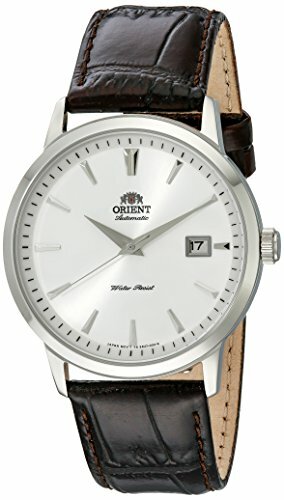 That is how I managed to find a whole range of quality automatic watches for less than 200 dollars. 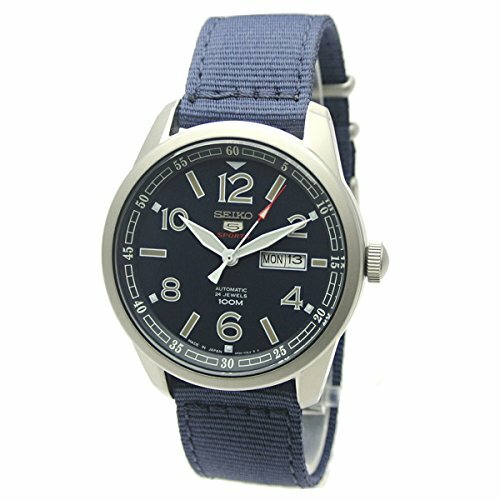 Watches from respsectable brands like Seiko, Bulova, Orient and of course some lower-end brands as well. In this review, I will show you all the options, as well as provide a mini-review on each, so that you can easily see what your options are and buy one today. 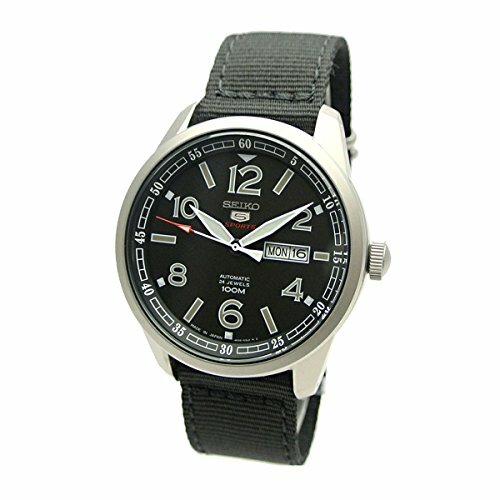 You can always rely on Seiko to give you great quality at an affordable price. That is not to say they don’t also produce more expensive watches, after all, they also produce the Seiko Grand, but their Seiko 5 range of watches are designed to be affordable, functional and long-lasting. 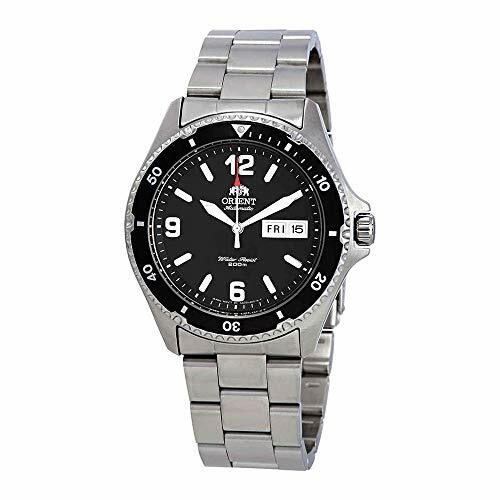 This particular model, the SNZF15 is one of their dive watch staples, and a great buy if you want something stylish and also with decent water-resistance (100m). It is an all stainless steel, workhorse of a watch that you will be proud to wear all day every day. Like their SKX models that are a touch more expensive, this one has theSeiko Automatic 7S26 movement, along with their own Hardlex crystal, that is the best alternative to sapphire for lower end watches. 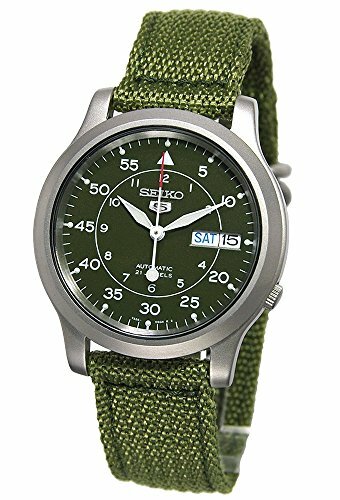 If you want to go even more affordable, and practical, there is nothing better than the pilot style SNK series of watches from Seiko. 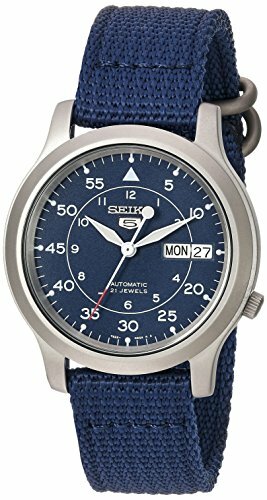 This model comes in a range of colors (blue, green, beige) with field/pilot style markings on the dial (minutes and hours) as well as a functional round case and nylon strap. The straps are not the most comfortable, so most people choose to buy and swap out a perlon or nato strap as soon as they get it. And these watches looks stunning with such a band. This is one of those watches that Seiko fans love for a reason. They last! Sticking with the affordable Seiko 5s, you almost can’t go wrong. 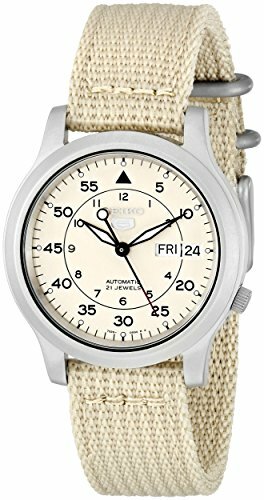 And this is yet another example of an automatic from Seiko that is often around the 200 dollar mark. The face is larger in terms of the Arabic numbering, and more bold and brash because of it. It will definitely suit those who like the flieger style of watch – simple, easy to ready, and long-lasting. Again, there is nothing to write home about in this specs on this watch – although it also has a full day/date window and 100m of water-resistance, which is great for the price. The Orient Bambino is a bit of a cult classic. They have been producing this crowd favorite for quite a few years now, and you have dozens of different models and colors to choose from. So, even if you don’t like the specific style of this one – take a look at their whole range and you will probably find one that you do. They are all dress-style watches, with simple and clear dials, with a small date window. The markings and hands differ on each, and one even has a small seconds sub-dial, and another with a small skeleton section – called “open heart”. 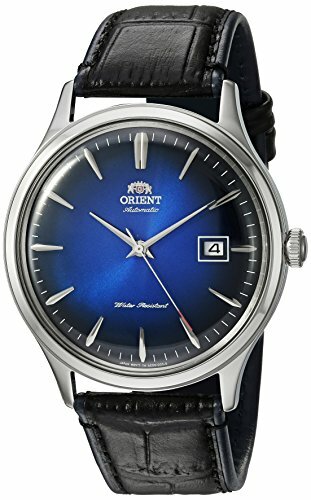 Inside is Orient’s reliable automatic movements, often their calibre F6724, along with their signature dome mineral crystal. This is a great choice for those who want to ooze style with their choice of automatic. And you will be shocked at how afforable they are! 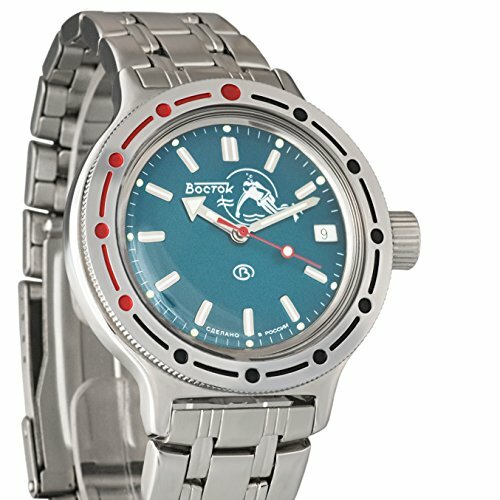 It’s always a toss up between the Orient Mako and Ray when it comes to their affordable dive watches. However, in this review, I chose to go with the Mako II. It is a classic dive style watch with uni-directional bezel, easy to ready dial, protected crown and all stainless steel case and bracelet. Of course, you only get mineral crystal at this price, but their automatic in-house movement, with hacking, hand-winding and 40 hours power reserve, is a worthy piece of machinery to keep your watch ticking. They have also give you 200m water-resistance, so real diving water-proofing too. All in all, you can’t go too wrong with a crowd pleaser like the Mako. 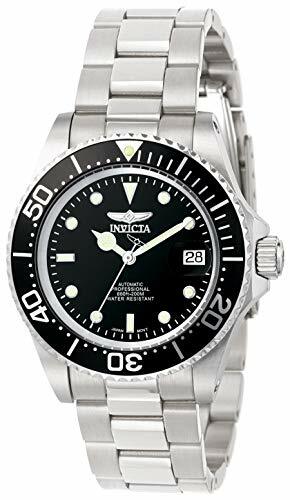 Invicta make very affordable automatics, which people often ignore. Except my dad, who has been wearing his for years he tells me. And this dive style model is a stylish looking automatic if ever I saw one. Again, it is very much inspired by the Rolex Submariner, but it is still unique enough to be its own. 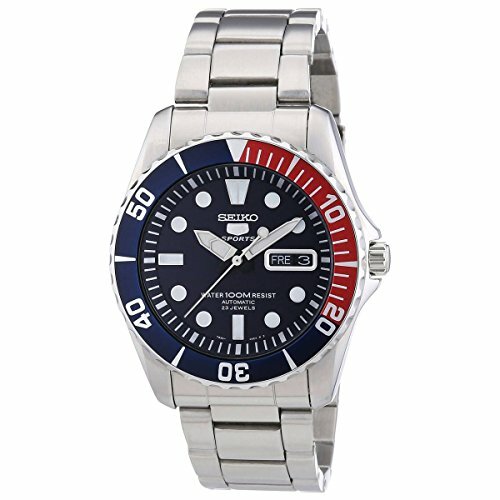 And although this is on the very low end of watch prices, it is still a proper dive watch in terms of water proofness, with 200m. Not bad in my opinion! People don’t often think of Russia when it comes to watches, but during WW2 when they could not get supplies of time pieces themselves, they decided to start investing in making them. The result was a few watch companies with great expertise and…affordable prices. 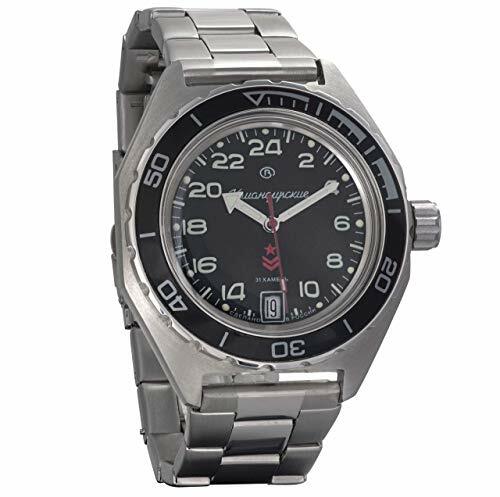 Vostok is one of those brands who produce a couple of watches worth looking at, one of which is this one – the Kmoandirskie. It is an automatic watch that also comes with 200m water resistance, a 24hr dial and date window. If you can get past the made in Russia stigma, it’s a great watch for way under 200. 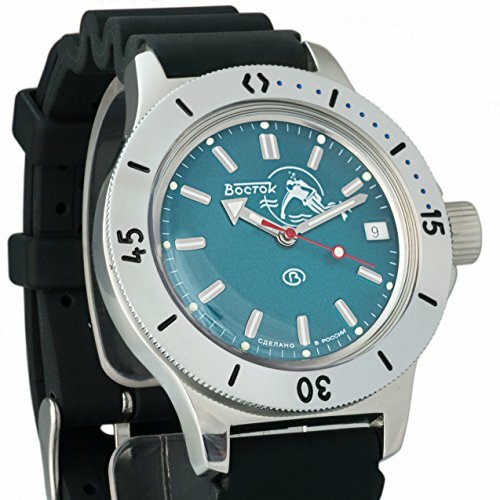 This particular Vostok model is one more people are familiar with, perhaps because it was worn by Bill Murray in the movie: The Life Aquatic with Steve Zissou. They even made a specific model for that movie, which I have reviewed before. Like the Komandirskie, this model has a Russian automatic movement, 200m water resistance and a date window. It comes with a variety of bezels and straps, so be sure to look around on the likes of Amazon before making a buying decision. The “classic” is with the red and black dots on the bezel. Each has the diver figure around 12 o’clock. But, you can get it with all stainless steel or a diver’s rubber strap if you prefer.